Create, assign, and grade your students' submissions. Review projects where students create their own questions on video already seen. Have learners create their own video and add interactions to increase engagement. Record a learner's presentation and have them reflect on their performance with comments in-situ. From the dashboard click New > Learner-Made Bulb. Enter a title for the assignment and click Create. Navigate to the triple dot menu, click Assign, and then select a course. Preview - View the bulb with embedded interactions. Edit - Make any changes to the bulb prior to sharing with colleagues or other learners. 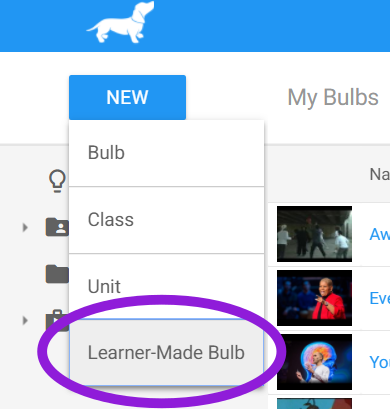 Copy bulb - Create a copy of the learner-made bulb in your own bulbs library. You can then assign/share the bulb with other students and colleagues. Feedback/Score - Grade the lessons (out of 10 points) and provide feedback.